There's nothing really strange about a ceramic hair iron, I guess. I just wonder why they're using the entire side of an old railroad car to advertise it. Is it that big of a deal? 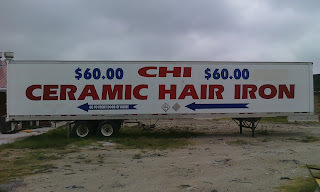 This is another in a series of "curious" signs found along I-30 between Dallas and Commerce. Its companions include billboards featuring the constipated Taco Boy, Texas beach grammar, Texas divorce lawyers, and Jesus's RV. Come drive the wonderland that is rural northeast Texas!